1. Maurice Fitzgerald WILSON, son of Richard Bassett WILSON (1806-1867) and Anne FITZGERALD ( -1877), was born on 4 February 1858 in London. He was a Civil Engineer. He was confirmed on 20 October 1874. He married Florence May BADNALL on 2 August 1884. He died on 23 December 1945. He was buried in December 1945. Maurice Fitzgerald Wilson was born on the 4th February, 1858, and died on the 23rd December, 1945. He was educated at Eton and at the Crystal Palace School of Engineering, and, after a short period at the Thames Ironworks, was articled in 1881 to Sir John Coode, K.C.M.G., Past-President Ins. S.E., spending most of his pupilage on the harbour works at Table Bay and Port Elizabeth. From 1883 to 1886 he was engaged on constructional work at Tilbury Docks for Messrs. Kirk and Randall and Messrs. Lucas and Aird, for whom he also worked on the Bodmin and Wadebridge Railway. In 1888 he was appointed resident engineer on the construction of the breakwater at St. Ives, Cornwall. From 1892 to 1895 he was resident engineer on the dock works of the London and South western Railway at Southampton. In 1896 he was appointed superintending engineer in charge of the survey for the Admiralty harbour, Dover, and later for the construction of the works, on which he was engaged until 1905. In 1906 he joined the firm of Coode, Son and Matthews, of which in 1924, on the death of Sir Maurice Fitzmaurice, Past-President Inst. C.E., he became senior partner. 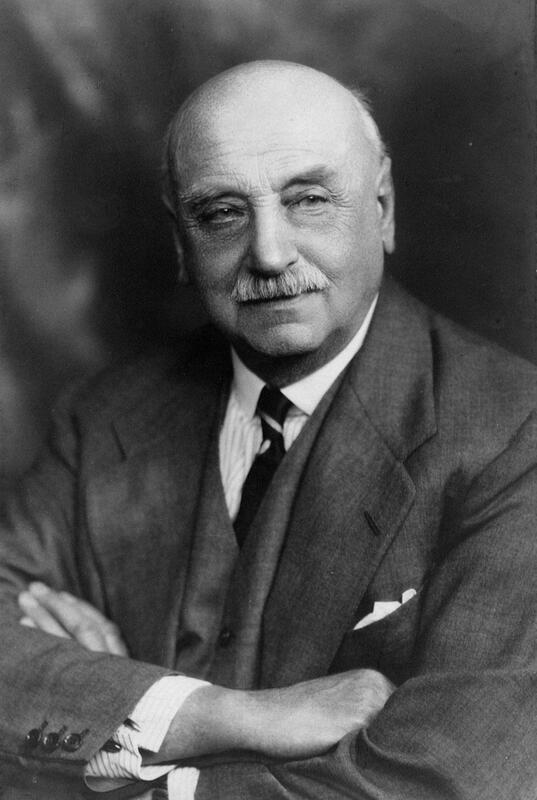 For nearly forty years he was engaged in the design and construction of harbours, docks, sea defence works, bridges and barrages, including dock extnesions for the Mersey Docks and Harbour Board; the Admiralty harbour of refuge at Peterhead; Fishguard harbour; the Lyttelton and gisbourne harbours, New Zealand; wharves and docks at Singapore; the Jahore causeway; Colombo harbour; entrance works and wharves at Lagos; harbour works on the Gold Coast, in Sierra Leone, and in Gambia; and work for the Whangpoo Conservancy Board, Shanghai. In 1921 he was appointed a member of the consultative committee ofengineers of the European Commission for the Danube. From 1929 to 1933 he was in charge of the technical investigation of the proposed Severn barrage, upon which the report issued in 1933 was based. 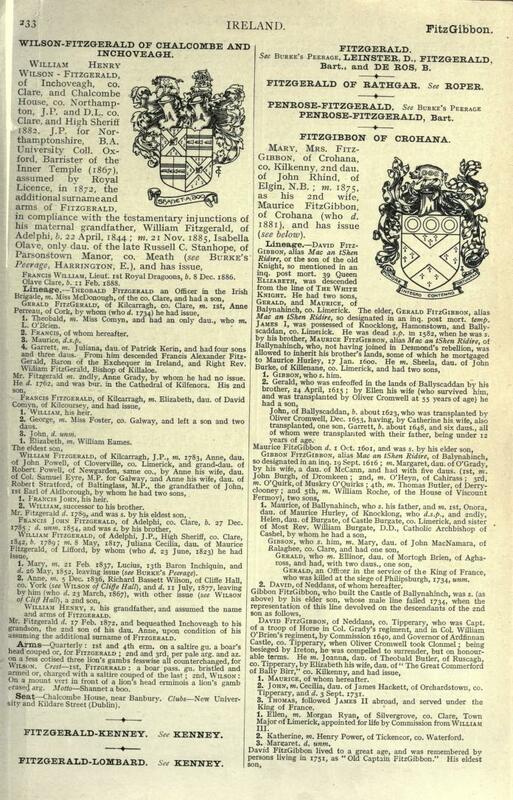 Mr. Wilson was elected an Associate Member of the Institution on the 5th February, 1884, and was transferred to the class of Member onthe 12th February, 1895. He was elected to the Council in November 1928 and became Vice-President in November 1937, but declined nomination for election as President in November 1940 owing to ill health. In the previous February he had been elected an Honorary Member of the Institution. In 1919 he presented a Paper on the Admiralty Harbour, Dover, for which he was awarded the George Stephenson Gold Medal and a Telford premium. He was a member of the Sea Action Committee and later acted as its Chairman. For many years he took a leading part in the work of the British Standards Institution, of which he was Chairman from 1922 to 1933, and honorary life chairman of its Engineering Divisional Council. In 1884 he married Florence May, daughter of the Venerable Hopkins Badnall, Archdeacon of the Cape, and had two sons. Mrs. Wilson died in 1941. Obituary, published in the Journal of Institution of Civil Engineers, vol. 26, 1945-6. Letter written to Maurice's son Fiennes' "Brass Hat" - a reference to his son's promotion within the Royal Navy? 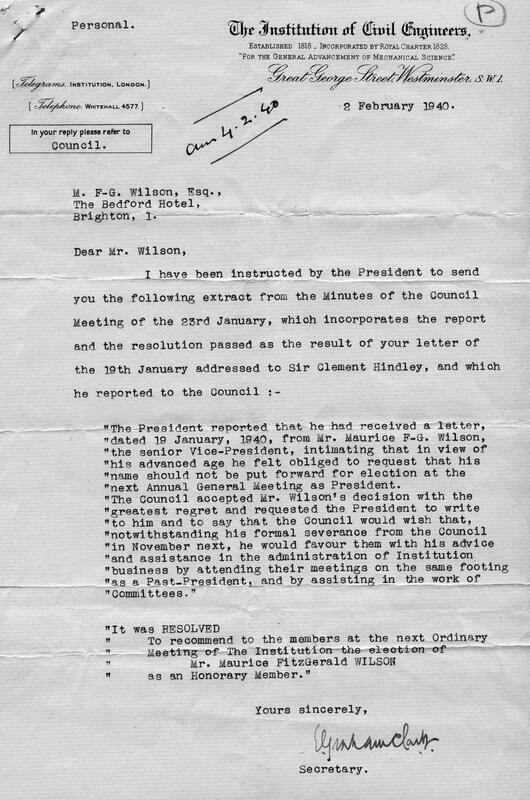 An image of the original letter is viewable as a Multimedia Object. Though you have been well known to me by name and reputation for some years I have never yet been brought into intimate relations with you so that in writing to offer you my congratulations I feel I should introduce myself lest you might think me presumptious. I understand you are now to adorn the head (of diminishing thatch?) of my son, up till this morning at 0000? hours a Lieutenant Commander R.N. and he, being as I have just said, my son, I introduce myself to you as his father. This will be clear and no doubt satisfactory. I feel it is a matter on which I may offer natural?? congratulations both to yourself and my son. To yourself fu?, though you will seldom have but? what I must describe as a birds eye view of him, you will I am sure be always comfortable and fairly well treated except upon the comparatively rare occasions when you may perchance be used as a water bucket or a football. At any rate I am sure you never be inconvenienced or pressed by any undue swelling of the temples. I am sure you will always be treated with consideration though you must not expect to be wrapped up in cotton wool. You will be carried high and will be naturally looked up to, provided this does not develope [sic] a squint. Nest?? in any case you may be sure the intention will be there. My son I think must also receive my heartiest congratulations on having become your possessor. It is a prize he has long looked forward to with hopes of obtaining and I need not tell you with what pride and pleasure his mother and I saw? and I may call the announcement of your marriage in the papers this morning. This letter is therefore to wish you every success in your future journeyings together. Maurice Fitzgerald reached the top of his profession of civil engineering. His work included the building of the harbour at St. Ives in Cornwall, where there is a plaque. The details of his distinguished career are given in his obituary - printed below. Maurice's grandson Peter entered the same firm two generations later, where he spent his entire career, ending up as Managing Director, when the firm of Coode and Partners ceased to be a partnership. Maurice was invited to become President of the Institute of Civil Engineers, but declined for family reasons. The correspondence about this is documented here. Maurice Fiennes Fitzgerald WILSON (1886-1975) (known as 'Fiennes'). Fiennes was born on 22 June 1886 in 2 Talbot Villas, Old Dover Road, Gravesend, Kent. He was a Naval Officer. He married Catherine Gladys MURRAY on 4 August 1914 in St Judes, Portsea, Portsmouth, England. He died on 16 February 1975 in Watlington, Oxon. He was buried in Putney Vale Cemetery. Bassett Fitzgerald WILSON (1888-c. 1972). Bassett was born on 1 September 1888 in St. Ives, Cornwall. He was a Soldier, artist. He married Muriel Gertrude SAMUELSON on 24 April 1915. He was buried circa 1941. He died circa May 1972. 2. Richard Bassett WILSON, son of John WILSON and Martha BASSETT, was born on 3 April 1806. He was a Magistrate and Landed Proprietor. He married Anne FITZGERALD on 5 December 1839. He died on 18 February 1867. 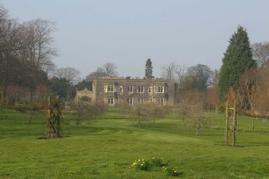 ...of Cliffe Hall, Darlington, N.Yorks. The 1851 census lists him as a "Magistarte and Landed Pasprietor?? occupying 60 acres of land employing 12 outdoor labourers and their wives. In the house at the time was a French governess aged 43 and ten servants. In 1861 there were again ten servants and a governess, but also two gardeners, a dressmaker, and a couple more staff. Cliffe Church, which is dedicated to All Saints, is of unknown foundation, but probably dates from Saxon times. The style of the present edifice is Early English. The fabric was thoroughly restored in 1855, when a "Priest's door," a piece of Norman work, was preserved on account of its antiquity. The tower is massive, and contains three bells, each of which bears the date 1664. The clock was presented by Mrs. Wilson, of Sea Croft Hall in 1841, and the east window, representing the four Evangelists, by Miss Sarah Wilson. There are also two stained glass windows in the south aisle to the memory of Richard Bassett Wilson, of Cliffe Hall, and Anne, his widow. The latter, representing the Raising of Jairus' Daughter, is a beautiful piece of work by Meyer, of London and Munich. There are some other stained glass memorials, and also several tablets to the Witham family, former lords of the manor, who were seated at Cliffe Hall from the middle of the 16th to the early part of the present century, when the estate was sold to the late John Wilson, Esq., grandfather of the present Colonel J. G. Wilson, The roof of the nave is open, with four clerestory windows on each side. The pulpit and font, both of white stone, were the work of Mr. Priestman, of Darlington, and a handsome, carved oaken screen and reredos, erected, in 1876, by Colonel Wilson [Richard Murrough Wilson], were executed by Henry Harwood, of Manfield. The lectern, also of oak, was the gift of Miss Yeoman, In the churchyard are several old tombstones, supposed to belong to the 13th and 14th centuries. Manfleld School A Glimpse into the Past,.. In the 1850's school building was taking place all over England and Wales. In the countryside the schools were predominantly Anglican, in the towns Methodist and to a lesser extent Roman Catholic, The reasons for this were varied. There was a genuine belief in the value of education and a humane impulse to better the lot of everyone. In addition Victorian industry and farming had a diminishing need for child Labour. Children - urchins are what they were called - were becoming a nuisance, especially in the towns. Schools had a custodial as well as educational purpose, which in part accounts for their church like architecture with high windows. Manfield is no exception to this development. In 1858 Richard Bassett Wilson, the then owner of Cliffe Hall and Estate gave one rood, two perches of land and an endowment for building Manfield Church of England School. It was at the same time that the Church was restored. The new building replaced a Dame's School, which stood on the site of what is now Four Oaks. Its purpose or "Mission Statement' was clear. It was ' for the education of children and adults, or children only of the labouring, manufacturing and other poor classes in the Parish of Manfield.' This meant the education given was to be elementary, the 3 R's, reading/writing, 'rithmetic and religion. Children from better off backgrounds would attend Grammar Schools where Latin and Greek were pursued if not taught - Richmond, Kirby Hill ("closed before the First World War) Polam Hall and the Darlington Grammar Schools were the nearest. The Minister or his Curate was to be in charge of the school, supported by a body of Church Wardens who were to ntribute 20 shillings a year to the upkeep of the school. When funding members resigned or died they could be replaced by others who were qualified by membership of the Anglican Church and subscription of at least 10 shillings a year, which bought one vote. Up to a maximum of six votes could be purchased for a donation of three pounds. There is nothing in the original trust deeds about the qualifications of the teachers apart from the headlined fact that ' the Master or Mistress must be a member of the Church of England' The grounds for sacking a teacher were clear - 'defective or unsound instruction of the children in religion' The emphasis on the religious worthiness of the teacher was, in part, due to the ferment in the Victorian Church. Charles Darwin was to publish ' The Origin of Species' in 1859. The ideas it contained about species evolving over tens of millions of years had been common for at least thirty years - there was great interest in fossil collecting, an activity undertaken by scholarly gentlemen. The view that man shared a common line of ancestry with the apes challenged orthodox religious teaching which one instance dogmatically asserted that the world had been created in 4004 BC. It is doubtful whether these debates reached Manfield and if they did it is a near certainty that they were not mentioned in the village school. Of more interest is a photograph from 1883 showing Miss Sophie Haines aged 23 with 30 school children. Those identified are Harry, Esther and Mary Boyd, the generation of the great grandparents and grandparents to Mrs. Graveney's family. There is also Mary Gowton and Jack Tweddle. Others have not been identified but no doubt have descendants living In the area. Children left school early in those days. In 1870 school was compulsory till 12. In 1902 the leaving age was raised to 13, in 1918 to 14. In 1944 the age went up to 15 and in 1973 to 16. Several villagers still remember the endless school gardening they were given to do when there was little for older pupils to do, especially in the post war years when books were in short supply. In the mid 1950's the school ceased to be an all age elementary school. Those who passed the eleven plus or 'scholarship' transferred to Richmond Girls High School or Boys' Grammar School or to the Richmond Secondary Modern - now combined as the Richmondshire School and one of the highest achieving in the country. Manfield Church of England School still educates children aged 5 - 11 in a Christian ethos and has been praised in OFSTED and other reports for the all round achievement of its pupils. When the school opened the telephone had been invented, but was not in use, there was no electricity, the car was at least thirty years away, the modern bicycle did not exist and manpower meant just that - a lifetime of heavy physical work in farms or in factories for men, and for women, long hours in domestic service or shops. In 2003, 145 years since Manfield School was founded a pupil at eleven is not half way through his/her education as the effective leaving age is now 18 because of Sixth Form Education and Vocational Training Schemes. .... the following years have been difficult to trace, therefore the next record found was that of 1751, when the village belonged to Lord Marmion, the owner of Tanfield. Then, just over a hundred years later, in 1857, Richard Basset Wilson became owner. In 1823, when Edward Bains published his History Directory an Gazeteer of the county of York, he had this to say about Manfield: Manfield, in the wapentake of Gilling East, and liberty of Richmondshire: 9 miles north of Richmond; a parochial village; the church is an ancient structure with a tower steeple, and is dedicated to St Michael. The living is a rectory, in the patronage of the King. Here is a small free school, with an endowment of 10l. per annum. Population 440. More Information: M.A. 1833, incorp. from Oxford. [Eldest s. of John, Esq., of Seacroft Hall and Cliffe Hall, Yorks. (and Isabella, dau. of Richard Bassett). B. Apr. 3, 1806.] Matric. from University College, Oxford, Oct. 22, 1824, age 18; B.A. 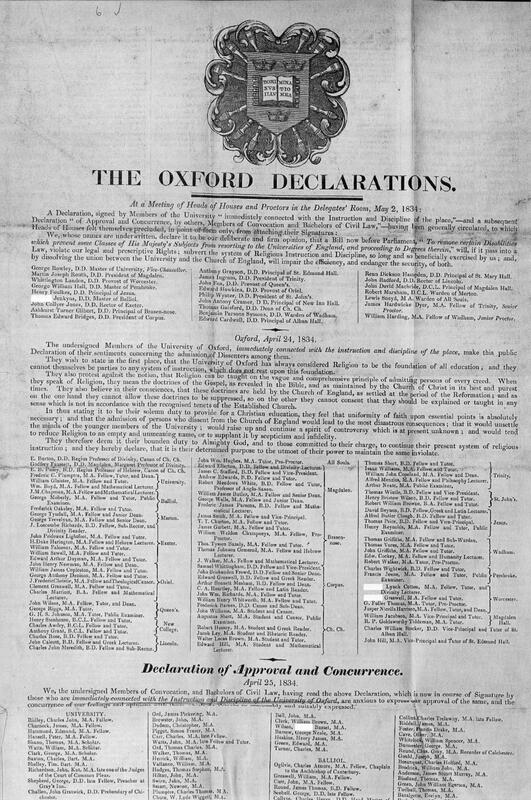 (Oxford) 1829; M.A. (Oxford) 1833. Adm. at Lincoln's Inn, 1829. Of Cliffe Hall, Yorks. Married, Dec. 5, 1839, Anne, dau. of William Fitzgerald, Esq., of Adelphi, Co. Clare, and had issue. Died Mar. 23, 1867. Brother of John (1825). (Al. Oxon. ; Inns of Court; Burke, L.G., which gives Feb. 18 for date of death; G. Mag., 1867, I. 683.). He studied at University College, Oxford and then at Lincoln's Inn for the law. The 1851 census lists him as a "Magistrate and Landed Proprieter occupying 60 acres of land employing 12 outdoor labourers and their wives. In the house at the time was a French governess aged 43 and ten servants. In 1861 there were again ten servants and a governess, but also two gardeners, a dressmaker, and a couple more staff". He performed the duties of a typical man of the gentry, including endowing a local school and helping the poor. There are two stained glass windows in the local Manfield Church dedicated to the memory of Wilson and his wife. 3. 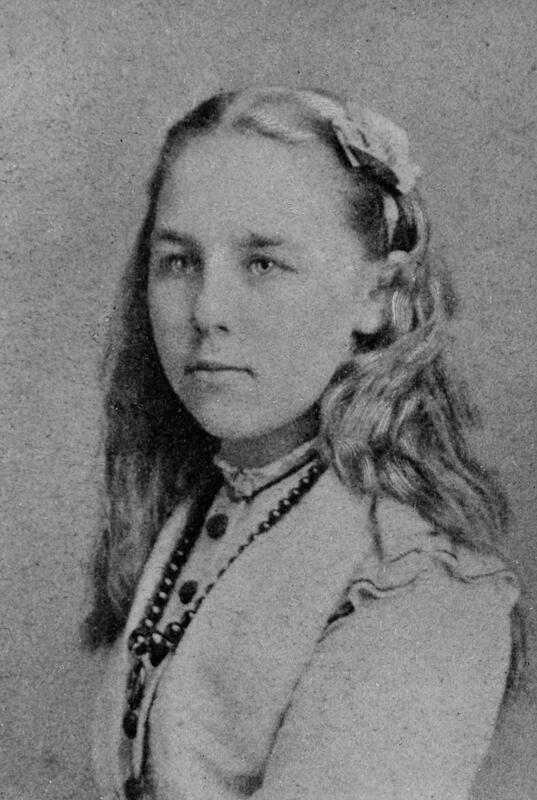 Anne FITZGERALD, daughter of William H.W. FITZGERALD and Juliana Cecilia FITZGERALD, was born. She appeared in the census. She celebrated her Bar Mitzvah. She died on 11 July 1877. Anne was one of two daughters of William Fitzgerald, a Sheriff and JP from County Clare in Ireland. Her younger sister Mary married Sir Lucius O'Brien, 14th Baron Inchiquin. The Fitzgerald family motto is "Shanet a Boo" (No literal translation of the Fitzgerald Motto has been located to date. It is thought to be a corruption of Shanid, a land grant in County Limerick to the Fitzgeralds in 1197 and the site of Shanid Castle. Suggestions range from the battle cry "Shanet to Victory" to "My Home is My Castle", "Long Live" etc.). Juliana Cecilia WILSON (1840?-1898). Juliana was born in 1840 (estimated). She married Thomas Charles Johnson SOWERBY on 14 September 1865. She died on 11 November 1898. John Gerald WILSON (1841-1902). John was born on 29 December 1841 in Yorkshire, Man[s]field. He was a Colonel in the Army. He married Angelina Rosa Geraldine O'BRIEN on 4 June 1873. He died on 8 March 1902. William Henry FITZGERALD-WILSON (1844-1932). William was born on 22 April 1844. He was a Barrister. He married Isabella Olave STANHOPE on 21 November 1885. He died on 17 April 1932. Mary Lucia WILSON (1844?-1930). Mary was born in 1844 (estimated) in Kilnarsola, Co. Clare, Ireland. She died on 20 January 1930. Richard Bassett WILSON (1846-1901). Richard was born in 1846 in Cliffe Hall, Piercebridge. He was a Colonel in the Army. He died on 21 March 1901. Augusta Jane WILSON (1848- ). Augusta was born on 28 May 1848. She married Thomas Robins BOLITHO on 30 June 1870 in Westminster. Emily Gertrude WILSON (aft1851-1928). Emily was born after 1851. She married James Fitzgerald BANNATYNE on 17 December 1878. She died on 10 October 1928. 4. John WILSON, son of John WILSON and Sarah LUCAS, was born on 24 February 1767. He appeared in the census. He celebrated his Bar Mitzvah. He married Martha BASSETT on 17 October 1798. ... of Seacroft Hall and Cliffe Hall, nr. Darlington. Seacroft Village is of ancient foundation. It is listed in the Domesday Book and has the oldest remaining village green in England but, in fact, has a much older history. The Venerable Bede records the battle of Winwaed between King Oswy's forces and the, unsuccessful, invading Mercians under King Penda. Bede gives this as taking place near Seacroft on the 15th November 655AD. The name (originally Saecroft) is of Saxon origin - sae meaning pool or lake and croft meaning enclosure or farm. After the Norman invasion, Seacroft (as part of the parish of Whitkirk) was granted to Gilbert de Laci and it remained in the de Laci family until 1602, when James 1st granted it to George Shiletto whence it passed into the ownership of his wife and then to her second husband Sir Ralph Hansby. He sold it to James Nelthorpe of Windsor in 1656. In 1643 a battle between Royalists for Charles I and a group of Roundheads under Sir Thomas Fairfax, who were en-route from Tadcaster to Leeds, took place at Seacroft. Fairfax was obliged to retreat across Bramham moor. St James's Church was built in 1845 and the Wilson family, contemporary owners of Seacroft Hall, were major contributors to the cost. Seacroft Hall itself was thought to have been built by the Shilettos in about 1605. By the 19th century, the Manor of Seacroft was in the hands of the Wilson family. 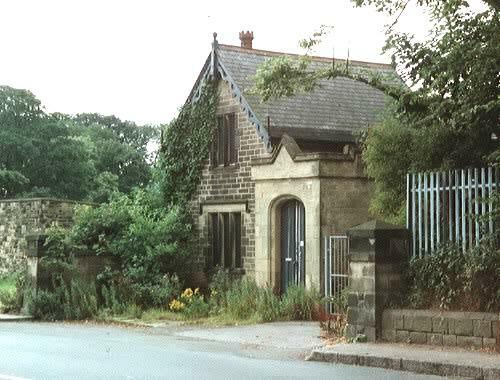 Darcy Bruce Wilson (1851 to 1936) was the the last owner of Seacroft Hall, which became derelict after his death. Though a listed building, it was demolished in 1954 and a High School now occupies its site. 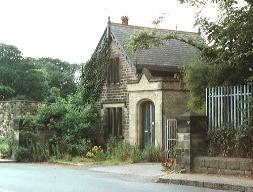 All that remains now of the Hall is the Lodge (gatehouse) on York Road, recently used as part of a Council depot but now derelict. 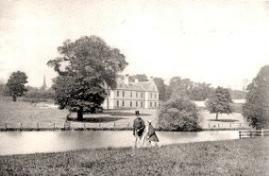 The illustration is a photograph of the Hall, taken about 1880, showing the lake which was latterly called the Fish Pond before being drained in the 1950's. There exists from 1840 a draft colliery lease relating to the mines and collieries of coal under the land at Seacroft and Austhorpe. John Wilson and Richard Bassett Wilson his son made this arrangement with Edward Waud of Chester Court, Cheshire. The full details are in archives in Cheshire. The lease was for a reversionary term of 21 years at ?00 per annum for every acre worked with a minimum o f ?200 per annum. There exists from 1840 a draft colliery lease relating to the mines and collieries of coal under the land at Seacroft and Austhorpe. John Wilson and Richard Bassett Wilson his son made this arrangement with Edward Waud of Chester Court, Cheshire. The full details are in archives in Cheshire. John Wilson of Nether Thong is listed as a Woolen Manufacturersin Kirkburton Directory of Trades and Professions for 1834. John WILSON (1808-1891). John was born on 1 January 1808. He married Anna Maria Isabella MACLEOD on 13 April 1846. He died on 29 January 1891. Jane Lydia WILSON (1815?-1898). Jane was born in 1815 (estimated). She married William SPOONER on 6 October 1841 in Whitkirk, Co. York. She died on 17 August 1898 in 8 Norham Gardens, Oxford. 6. William H.W. 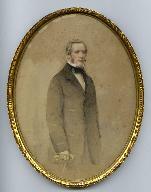 FITZGERALD, son of William FITZGERALD of Kilcarragh and Anne POWELL, was born in 1789 in Co. Clare, Ireland. He was a JP, High Sheriff, 1842. He died on 17 February 1872 in Cliffe Hall, Piercebridge. He married Juliana Cecilia FITZGERALD. ... of Adelphi, Co. Clare . In 1861, aged 72, he was living at the family seat of his daughter and son-in-law, Cliffe Hall in Yorkshire; he was still there 10 years later, but the census notes that by this time he was blind. The census also gives his occupation as Magistrate, presumably retired. William Fitzgerald was High Sheriff of County Clare in 1842. He had been a magistarte and Justice of the Peace. 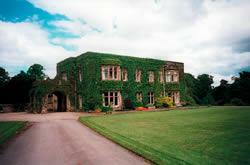 On his retirement, he came to live at Cliffe Hall in North Yorkshire, the home of his son-in-law Richard Bassett Wilson. He was still living there by 1871 (aged 80), and in the census of that year is described as being blind. A small glimpse into his life is gleaned from the following anecdote: "On Christmas Day, during the hours of Divine Service at Ardenny Church, and when Mr. Jones was reading the Communion Service, one of his servant maids,left at the Glebe-house with some children, ran into the Church and informed Mr. Fitzgerald, the Magistrate, that her Master's house had just been entered by two men, who minutely searched for arms, and succeeded in carrying away a musket in capital order. Mr. Fitzgerald, immediately went home, and getting information from Mr. Hurst that he saw a small boat on the Shannon with two men rapidly rowing towards the Co. of Clare shore, Mr. Fitzgerald, galloped off to Pallas and sent a party of Police to Ringmoylann-Quay." When he died, he bequeathed Inchoveagh to his grandson, on condition that he assumed the additonal surname of Fitzgerald. 7. Juliana Cecilia FITZGERALD, daughter of Maurice FITZGERALD and Mary William BURTON, appeared in the census. It is not known if her mother was indeed Mary Burton, or her father's first wife (name unknown). 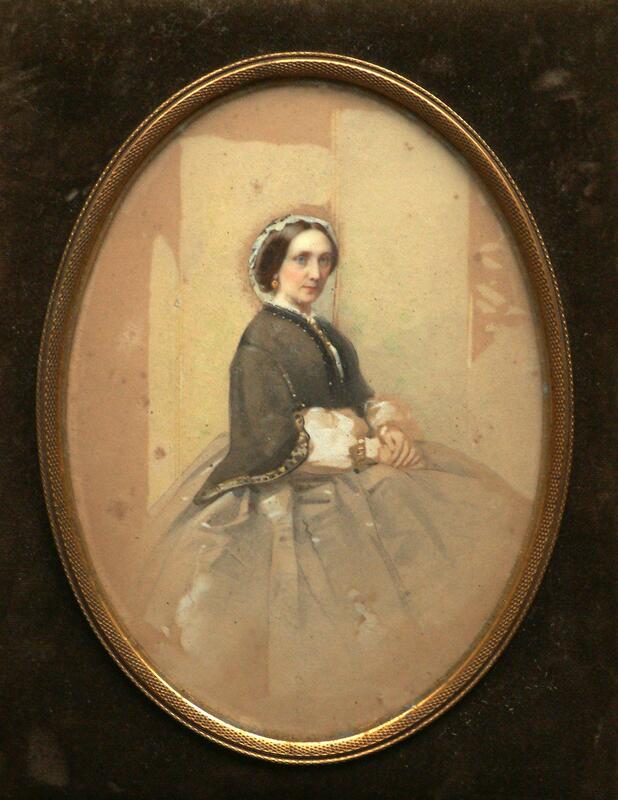 Mary FITZGERALD (1819-1852). Mary was born in 1819. She married Lucius O'BRIEN on 21 February 1837. She died on 26 May 1852. She was buried in Kensall Green Cemetery.